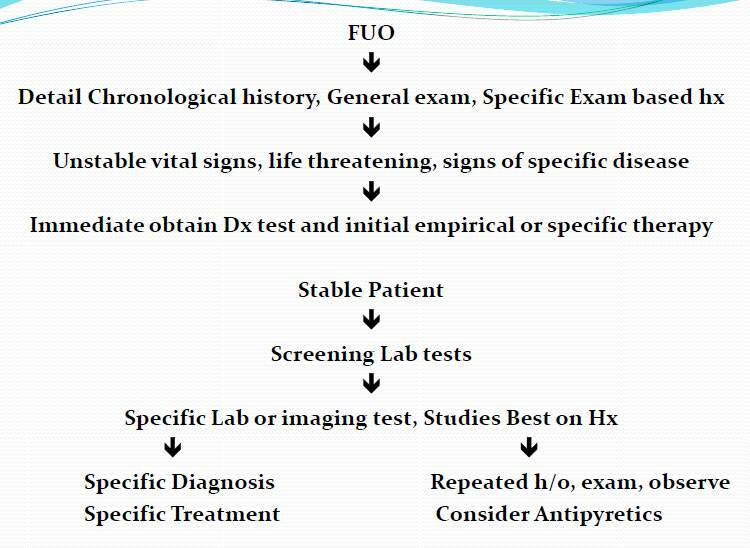 The term fever of unknown origin (FUO) is best reserved for children with a fever documented by a health care provider and for which the cause could not be identified after 3 wk of evaluation as an outpatient or after 1 wk of evaluation in hospital. Cunha BA.Fever of Unknown Origin. New York, NY: Informa Healthcare; 2007. Patients with fever not meeting these criteria, and specifically those admitted to the hospital with neither an apparent site of infection nor a noninfectious diagnosis, may be considered to have fever without localizing signs. An FUO in children has been defined as a daily rectal temperature greater than 38.3°C (101°F),lasting for at least 2 weeks, the cause of which has not been determined by simple diagnostic tests, including a complete history and thorough physical examination. Some experts would add that 1 of the 2 weeks of fever should be documented in the hospital. A Diagnostic Approach to This Vexing Problem. A careful history and physical examination is the first step in evaluating a patient with fever of unknown origin. Examination of the characteristics and distribution of the rash will help in the diagnosis of the cause. A maculopapular, petechial, or urticarial rash -bacterial infections or with medication-related fever. Viral infections -non-specific maculopapular or a petechial rash. Many inflammatory/vasculitic disorders present with a rash. Poor growth, poor appetite, and weight loss are observed with any chronic illness as opposed to a history that is of relatively short duration (e.g., bacterial infections). Absent tears are observed in autonomic disease. There may be a history of recent tick or mosquito bite with Lyme disease, Rocky Mountain spotted fever, and malaria infection. Bone pains are present in osteomyelitis, leukemia, juvenile idiopathic arthritis (JIA), and SLE. CNS symptoms -encephalitis, bacterial endocarditis, myocarditis, cerebral abscesses, tuberculous meningitis, secondary spread from a malignancy, severe inflammatory disorders (e.g., SLE), and cerebral malaria. Chorea is present with advanced rheumatic fever. Urinary symptoms of dysuria, frequency, and haematuria accompany UTIs such as cystitis and pyelonephritis. Heart rate-Tachycardia -common with fever, but persistent tachycardia may suggest thyroid storm or endocarditis/myopericarditis. Respiration-Tachypnoea may be present in pneumonia, or multisystem disorders with lung involvement. Hypertension-inflammatory/vasculitic disorders, chr pyelonephritis, SLE, and thyroid storm. Postural hypotension -toxic shock syndromes, medication-related, and autonomic disorders. Pallor-leukemia, lymphoma, most chronic bacterial infections and inflammatory/vasculitic illnesses, malaria, and tuberculosis. Jaundice-Present in patients with hepatic abscess and infectious mononucleosis. Clubbing-Present in patients with endocarditis, inflammatory bowel disease, and tuberculosis. Isolated cervical lymphadenopathy -Kawasaki disease and cat-scratch disease. Disseminated lymphadenopathy -Infectious mononucleosis, CMV, toxoplasmosis, leukemia, lymphomas, tick-borne illnesses, and some inflammatory/vasculitic illnesses. Most bacterial infections give rise to regional lymphadenopathy. The ulceroglandular form of tularaemia typically presents with lymphadenopathy. For Serious cases no diagnostic test should be delayed. o Consider if fever may be due to intrabdominal abscess -psoas abscess or cat scratch disease . Computed Tomography Scanning- If USG fails to help reveal the diagnosis, obtain CT scans of the abdomen in all patients with symptoms suggesting an intra-abdominal process, Intravenous pyelographymay be more sensitive than CT scanning in detecting processes involving the descending urinary tract, but CT scanning is preferred for most other processes of the retroperitoneal space. Upper and lower gastrointestinal tract, including retrograde cholangiography when indicated or when searching for Crohn disease,Whipple disease, biliary tract disease, and gastrointestinal tumors.. Ventilation and perfusion radionucleotide studies to document pulmonary emboli. A technetium bone scan may be a more sensitive method for documenting skeletal involvement when osteomyelitis is suspected in a patient in whom conventional radiography has shown no compatible changes. Consider radionucleotide studies using gallium citrate or granulocytes labeled with indium In 111 (111In) for diagnosis of occult abscesses, neoplasms, or soft-tissue lymphomas. Generally avoid empiric treatment with anti-inflammatory medications or antibiotics as an effort to diagnose the patient’s condition. O Clinically deteriorating with suspicion of bacteremia or sepsis. Antibiotics if used should be at targeted disease rather than blancket therapy with 4-5 antibiotics. 3.Cases in which temporal arteritis with vision loss is suspected. Inpatient Treatment-No evidence supports prolonged hospitalization in patients who are clinically stable and whose workup findings are unrevealing. Outpatient Care-Conduct close follow-up procedures and systematic reevaluation studies to prevent clinical worsening. Guide further workup studies on an outpatient basis. Patient Transfer-The need for transfer is indicated if (1) the current facility is unable to establish a diagnosis, (2) diagnostic tests are unavailable at the existing facility, or (3) the patient deteriorates clinically. 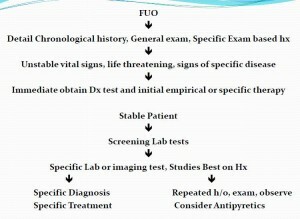 Several studies have found that prolonged, undiagnosed FUO generally carries a favorable prognosis. 5.Feigin RD, Shearer WT. Fever of unknown origin in children.Curr Probl Pediatr.1976;6:1ospital. Yes , it was my presentation at PAHS.